In honour of Bug Pudding Day, I have done this single panel comic which sums up how I feel about the work of J.P. and Sara Keslensky. It’s the 10th anniversary of this great webcomic and I urge you to go and read it if you are unfamiliar with it! But if you’ve been following GITM, you’ll definitely know of Bug Pudding. J.P. is a frequent commenter on this sight and is the most encouraging of all the cartoonists I have ‘virtually’ met since I started this. 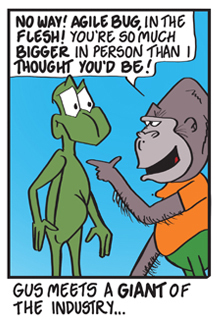 J.P. also somehow manages to come up with a great and witty comment for ever comic he comments on! Honestly I may well have completely abandoned this comic if it weren’t for J.P., so thanks so much! And keep up the great work, J.P. and Sara! I’ll be back soon with a new chapter of GITM! Stay tooned! As promised, here is an example of the kind of thing I do that I call “art.” This is an original song by my alter ego Stan Dickie with an animated ‘moving painting’ to accompany it. It’s called Little Dickie! Enjoy!